Festival Calendar: Which Calendar Should We Use? To celebrate the biblical festivals, we need to know when they occur. And to know that, we have to know what festival calendar was used in the Bible. To observe “the feasts of the LORD” described in the Bible (Leviticus 23:2), you need to know when they occur. And to know that, you have to know what calendar was used in the Bible. Which calendar should be used is not a question to which most people give any thought. But throughout history, calculating an accurate calendar has been challenging. 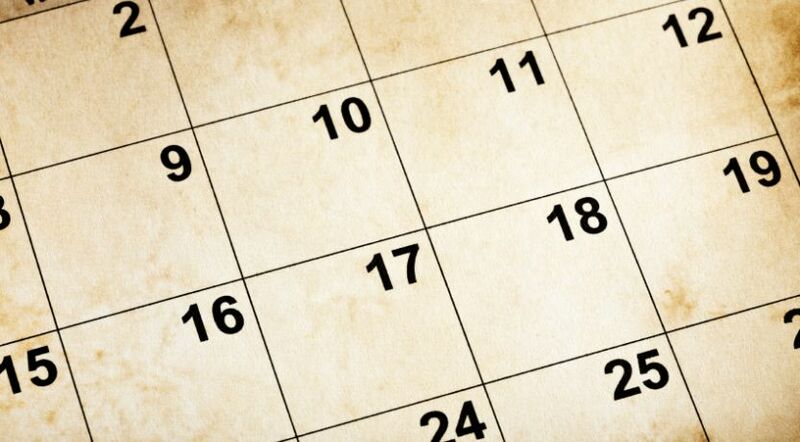 The calendar used by much of the world today was not instituted until 1582 by Pope Gregory XIII. He ordered it to correct errors in the Julian calendar, established in 45 B.C. by Julius Caesar. Many Protestant countries did not adopt the Gregorian calendar for centuries. By the time England adopted this calendar in 1752, its Julian calendar was 12 days behind the seasons. To this day, many Orthodox churches refuse to accept the Gregorian calendar, and they still use the Julian calendar, which is now 13 days behind. Both the Julian and the Gregorian calendars are purely solar calendars, meaning they are calculated on the basis of the movements of the sun. By contrast, the Muslim calendar is purely a lunar calendar, based solely on the cycles of the moon. Its months are not connected to the seasons and therefore can vary considerably from the Gregorian calendar. That is why Ramadan, the Muslim month of fasting, does not coincide with any fixed month on the Gregorian calendar. Therefore, today’s Gregorian calendar is relatively new, only a little over four centuries old, in comparison to approximately 6,000 years of human history. Clearly, it wasn’t the festival calendar in use when God told Moses, “This month shall be your beginning of months; it shall be the first month of the year to you” (Exodus 12:2). Can we know which calendar was used when God revealed His annual festivals (Leviticus 23)? The Bible itself does not give enough details to construct a festival calendar. But it does tell us when the festivals occur according to a calendar. The Passover is to be observed on the 14th day of the first month, followed by a weeklong Feast of Unleavened Bread, which begins on the 15th day of the same month (Leviticus 23:5-6). (The Hebrew word translated “month” is also the word for the new moon.) The festivals also tie into the seasons, as the harvest began during Unleavened Bread (Leviticus 23:10). In addition to this incredible accuracy, the Bible itself points us to the Jews as the guardians of the oracles of God, which would include the Hebrew Scriptures and the festival calendar. The next festival, Pentecost, was determined by counting seven weeks plus one day (the word Pentecost means “fiftieth” in Greek) from a specific day related to the Unleavened Bread festival. The Feast of Trumpets is observed “in the seventh month, on the first day of the month” (Leviticus 23:24). The Day of Atonement falls on the 10th day of the seventh month, followed by the final festivals of the year. The Feast of Tabernacles begins on “the fifteenth day of this seventh month” (Leviticus 23:34), followed a week later by the last festival of the year (verse 39). These festivals are date-specific, so it is critical that one knows what festival calendar to use in determining them. They are also season-specific. The first festivals coincide with the beginning and end of the spring harvest season in the Holy Land; the last festivals, with the fall harvest season. Neither a purely solar calendar nor a purely lunar calendar can determine these dates accurately. A solar calendar comes close to coinciding with the seasons, but it doesn’t reflect the cycle of the moon necessary for determining the biblical months. A purely lunar calendar doesn’t even come close to coinciding with the seasons. However, the Hebrews have preserved a solar-lunar calendar that coincides with the seasons. It is calculated by both the movements of the sun and the cycles of the moon. “The calculation of the calendar was transmitted to the sages in an unbroken chain going back to Moses. ... According to the ancient calculations, the exact time between one new moon and the next is 29 days, 12 hours, and 793 chalekim ‘parts of an hour’ (the hour is divided into 1080 parts). In other words, one lunar month has 29.53059 days. It is interesting to note that according to NASA (National Aeronautics and Space Administration), the time between one new moon and the next is 29.530588 days. Of course, NASA has at its disposal the most advanced and sophisticated telescopes and computers. Nevertheless, the difference between NASA’s figures and that used by Hillel II, which originated more than 3000 years ago, is .000002 or two millionths of a day, calculated for the period of one month” (Avraham Yaakov Finkel, The Essence of the Holy Days—Insight from the Jewish Sages, 1993, p. 141). In addition to this incredible accuracy, the Bible itself points us to the Jews as the guardians of the oracles of God, which would include the Hebrew Scriptures and the festival calendar. Paul wrote, “Chiefly because to them were committed the oracles of God” (Romans 3:2).